Every summer KCAT Arts Centre runs a six day/once a week Summer Studio for artists of any level who are interested in developing their work. It takes place in our large airy and light studio space with access to basic equipment and some essential materials. Artists are advised to bring specialist equipment and their own brushes. Canteen facilities are available for lunch and tea breaks. The cost is 120 euro for six days/ 20 euro a day. I am on hand to guide and assist, for any advice or feedback you may need, but the small group of peers you will meet and work with provide invaluable support and encouragement during this time. KCAT is delighted that Inclusion Ireland are leading an exciting day of talks and discussion in Callan on Thursday 6th July as part of Inhabitants, the Arts Strand of the Abhainn Rí Festival 2017. 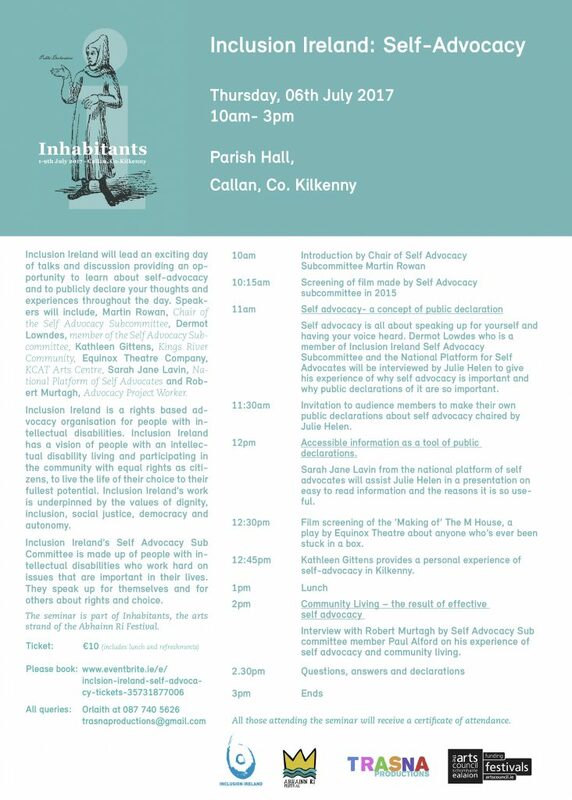 Inclusion Ireland will lead an exciting day of talks and discussion providing an opportunity to learn about self-advocacy and to publicly declare your thoughts and experiences throughout the day. Speakers will include, Martin Rowan, Chair of the Self Advocacy Subcommittee, Dermot Lowndes, member of the Self Advocacy Subcommittee, Kathleen Gittens, Kings River Community, Equinox Theatre Company, Sarah Jane Lavin, National Platform of Self Advocates and Robert Murtagh, Advocacy Project Worker. Inclusion Ireland is a rights based advocacy organisation for people with intellectual disabilities. Inclusion Ireland has a vision of people with an intellectual disability living and participating in the community with equal rights as citizens, to live the life of their choice to their fullest potential. Inclusion Ireland’s work is underpinned by the values of dignity, inclusion, social justice, democracy and autonomy. Inclusion Ireland’s Self Advocacy Sub Committee is made up of people with intellectual disabilities who work hard on issues that are important in their lives. They speak up for themselves and for others about rights and choice. Inhabitants is a series of events and activities across visual arts, architecture and theatre, which highlights the diverse and innovative work happening in the arts in Callan and across Ireland. This year focuses on one key theme, Public Declaration. We’re delighted to invite guest curator Róise Goan to devise Testimony – stories of courage, stepping out of the comfort zone into the unknown, citizenship and its relative freedoms and burdens, love, belonging and standing out. Our programme allows for new audiences and those familiar to engage in cutting-edge art experiences in our small town. Inhabitants is produced by Trasna Productions with the support of the Arts Council of Ireland Small Festivals Award and Kilkenny Leader Partnership. Special thanks to the Abhainn Rí Festival, Callan Community Network, KCAT Arts Centre, Callan Workhouse Union, Monkeyshine Theatre, Inclusion Ireland and Fennelly’s for their ongoing support and collaboration. 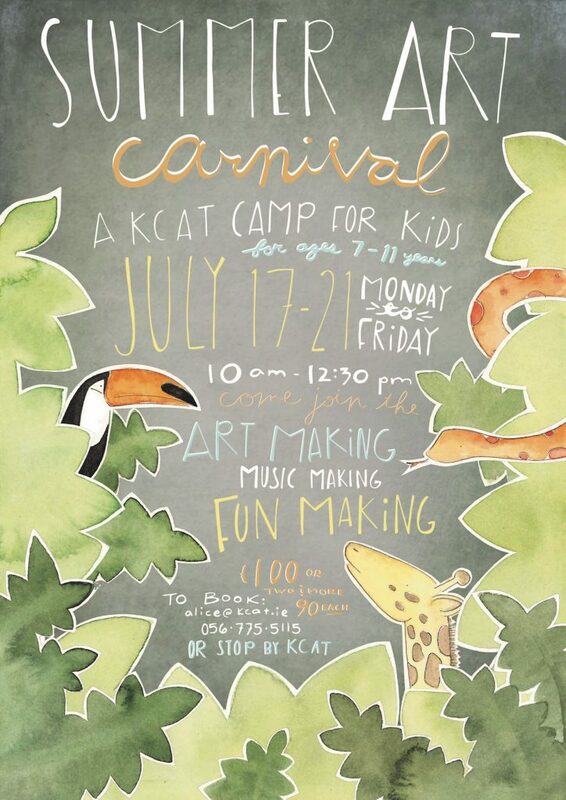 A summer camp for children aged 7 to 11 years old takes place this summer in KCAT Arts Centre from 17th to 21st July. Every morning from 10 am to 12.30 pm, a variety of arts skills will be explored. There will be music and art making delivered in a fun, safe and inclusive environment by an experienced tutor. Emphasis is on process rather than product but there will be plenty to take home! All materials are provided. The course costs 100 euro for one child and 90 euro per child if there are two or more from one family. Please contact KCAT if you would like any more information or would like us to send you an application form. Phone 0567755115 or email alice@kcat.ie . You can also access the application forms here online. 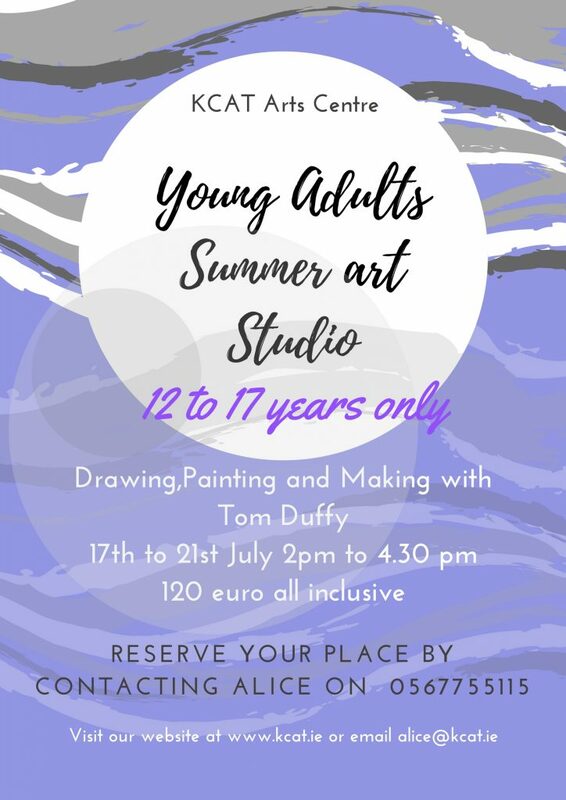 At KCAT we have designed a week of summer art for young people aged 12 to 17 years old .This year it will take place from 17th to 21st July from 2.pm to 4.30 pm. KCAT Arts Centre offers a unique environment which is safe and welcoming to all young people of varying abilities. Our experienced tutor will direct and guide each individual in their artistic and creative development towards success. Personal projects are welcome but instruction is also provided. The aim of the week is to impart skills and foster self-confidence while working side by side with like-minded peers. The cost of the workshop for the week, all materials included, is 120 euro. Our Open Studio Summer Studio provides a light airy space for working on personal projects. Suitable for artists who can work independently and who enjoy a peer group atmosphere. Every Thursday from 10 am to 4 pm from 27th July to 31st August, the cost of the studio is €120. Bring your own materials and lunch. Spaces are limited. The application form can be filled in online or call 0567755115 / email alice@kcat.ie for more information. A workshop on how to make sculptures and temporary landscape interventions, to inspire participants to the limitless potential of making art in the natural environment. By creating individual and group pieces of work, you will explore the meadows own natural materials as an artist’s medium. This workshop is free - donations welcome! All donations on the day will go towards a KCAT Bursary for young students with less opportunities. This workshop is dedicated to Jean Conroy – Artist & KCAT Facilitator who inspired many to create in this way.